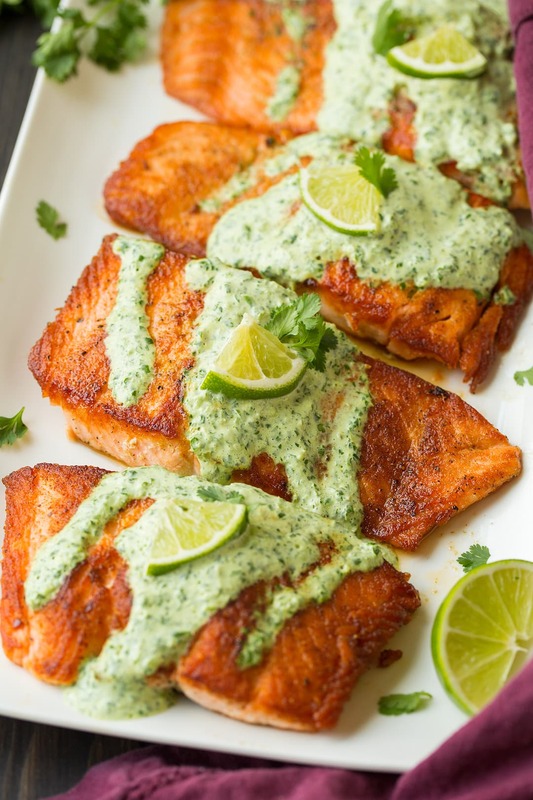 Salmon with Creamy Cilantro Lime Sauce is such an exciting way to make salmon! It’s boasting with so much fresh flavor and who could resist that sauce! Not to mention you can have this ready in 20 minutes, can’t beat that. 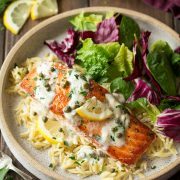 Pan Seared Salmon with an Irresistible Creamy Sauce! Lately I’ve been obsessed with just searing the salmon in a pan, I think it may actually be my choice method of cooking it – with grilling in a close second. I just love the way it gets this perfectly seared crisp crust on the exterior while the interior stays perfectly tender and doesn’t dry out. I also love the pan searing method because it’s one of the quickest. No preheating an oven or grill and it’s ready in about 7 minutes. 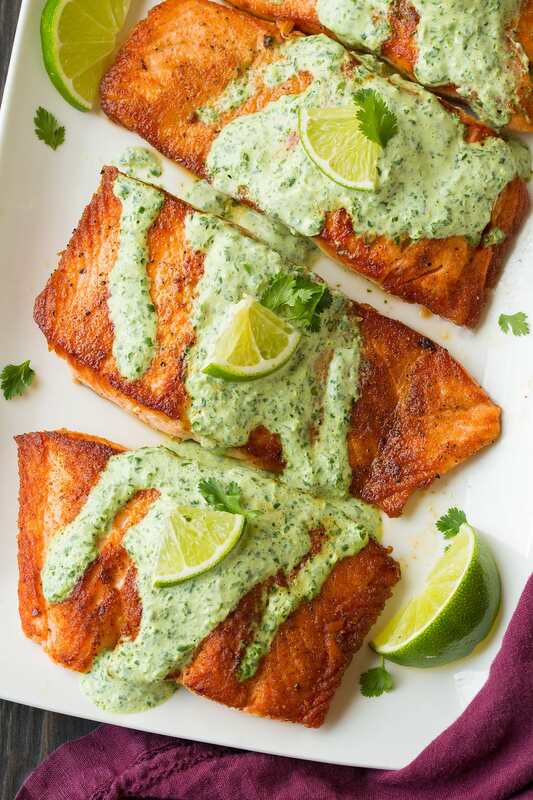 This salmon is packed to the max with flavor thanks to a simple light rub, which consists of cumin, coriander and cayenne pepper, then it’s topped with the simplest fresh sauce, which consists of sour cream, cilantro, lime juice, green onions and garlic. All good things right? I knew this was going to be good but it was even better than I was expecting. When measuring out the cilantro just be sure to pack it into the measuring cup otherwise you won’t get as much flavor – the cilantro really is the crowing flavor it. Also be sure to let the skillet get hot before you add the salmon so you get a good sear on it. Don’t move the salmon as it cooks. Also key in getting it to brown nicely. 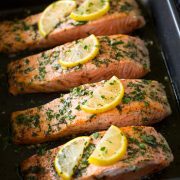 If you like salmon and easy, quick recipes then please try this salmon recipe! I’m really just obsessed with how delicious it is! On a side note if you have a bigger family than me and need more servings, you should have enough sauce for about 5 – 6 fillets just be sure to increase the amount on the spice rub and use two skillets. 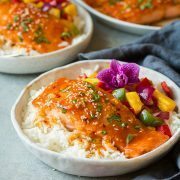 This is such an exciting way to make salmon! It's boasting with so much fresh flavor and who could resist that sauce! Not to mention you can have this ready in 20 minutes so it's perfect for a quick dinner. For the sauce: add sour cream, green onions, cilantro, lime juice, garlic and season with salt to taste (about 1/4 tsp). Process until cilantro has been very finely minced. Set aside at room temperature while preparing salmon. In a small bowl whisk together cumin, coriander, cayenne pepper, 1/2 - 3/4 tsp salt (depending on how salty you like things) and 1/2 tsp black pepper. Dab both sides of salmon dry with paper towels, season both sides evenly with cumin mixture and lightly rub over salmon. Heat a (heavy) 12-inch non-stick skillet over medium-high heat. Add oil and once oil is shimmering add salmon (top side down first. Also leave space between fillets) and cook about 4 minutes, without moving, until golden brown on bottom. Flip and cook salmon on opposite side until salmon has cooked through, about 2 - 3 minutes longer. 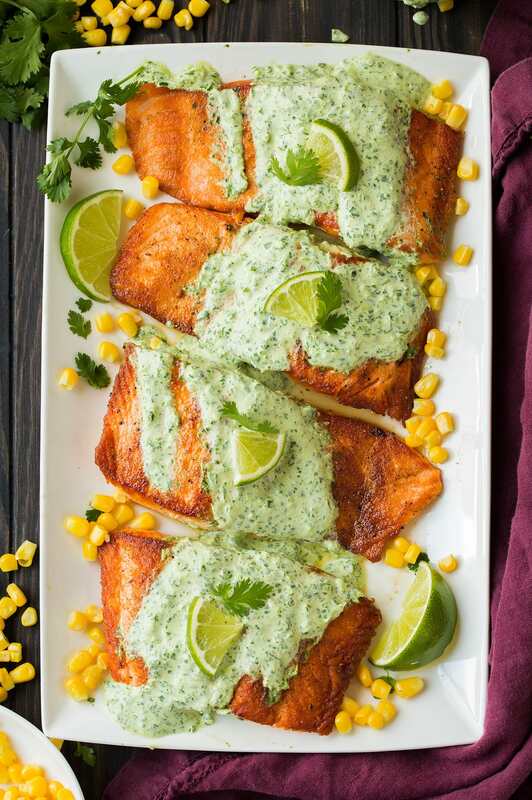 Serve warm with Creamy Cilantro Lime Sauce.